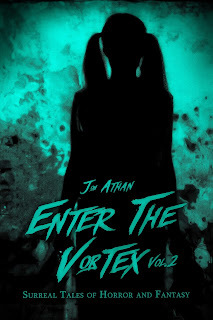 Jon Athan: Enter The Vortex Vol. 2 coming August 1st, 2015! Are you ready to return to the Vortex? Enter The Vortex Vol. 2: Surreal Tales of Horror and Fantasy will release on August 1st, 2015 exclusively on Amazon.com. This full-fledged sequel is over 100 pages long* and features ten surreal stories of horror, fantasy, and science-fiction. Starting today, Enter The Vortex Vol. 2 is available for pre-order at $2.99 and the book will be available in the Kindle Unlimited program upon release. Enter The Vortex Vol. 2 features ten unique and surreal stories. The stories include terrifying phantoms, eerie doppelgangers, deadly diseases, devious psychics, endless elevators, spontaneous time travel, and much more. These surreal stories delve into the deepest and darkest crevices of the tormented mind. Although I despise spoilers, I must warn: like the previous installment, expect the unexpected. As previously stated, Enter The Vortex Vol. 2: Surreal Tales of Horror and Fantasy releases on August 1st, 2015 for $2.99 — exclusively on Amazon.com! You can pre-order today, purchase after the release date, or use the Kindle Unlimited program to read it as part of your subscription. Regardless, thank you for the support. I hope you enjoy this set of surreal stories! *According to Amazon's page estimates.